Let's just start - Every time any person, organization, think tank, academic or non-profit speaks out against Title II, Net Neutrality or privacy - and they didn't tell you that they are funded directly or indirectly by the phone and cable companies (Verizon, AT&T, Comcast, Spectrum, etc. ), or their associations, the NCTA, the cable association, CTIA, the wireless association, and the USTA, the wireline association, just say - I don't believe you. This trimmed excerpt is from a letter by a group called TechFreedom about a meeting at the FCC. 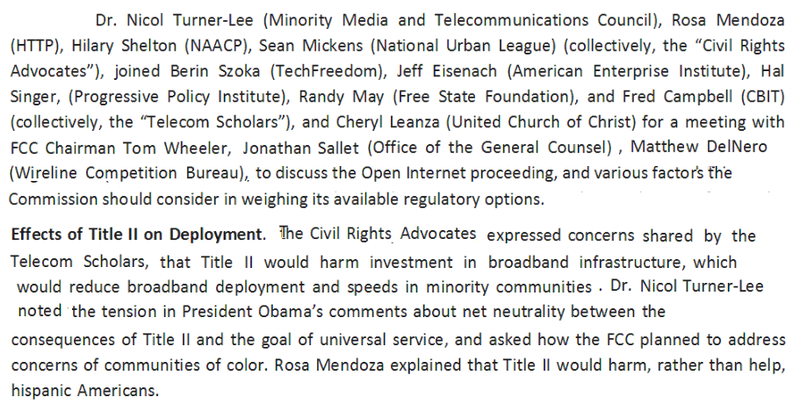 The meeting included non-profits that represent minorities who are funded by AT&T, Verizon and the cable companies in multiple ways, and "telecom scholars", who are also funded by the telco-cable cabal. 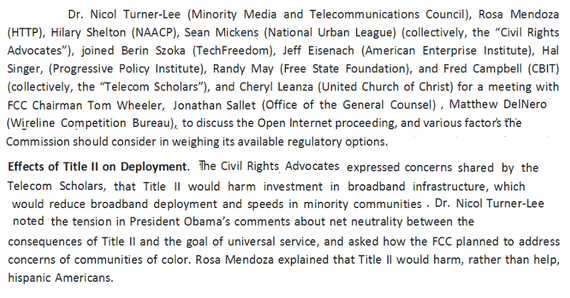 This meeting was to show that "minorities" and the "scholars" all believe that Net Neutrality and 'Title II' will harm investment. In our next article we will explain just how specious their arguments are. As previously discussed many times (using Verizon's own state-based annual reports and filings), Verizon has classified the company's entire fiber optic deployment, including FiOS, as Title II for decades. This has allowed Verizon to charge local phone customers (and minorities) billions for the build out of networks most will never get. Worse, Verizon has cross-subsidized the wires to the cell sites using the wireline budgets that should have been used to upgrade and maintain the states' utility infrastructure up and down the East Coast. But I get ahead of myself. 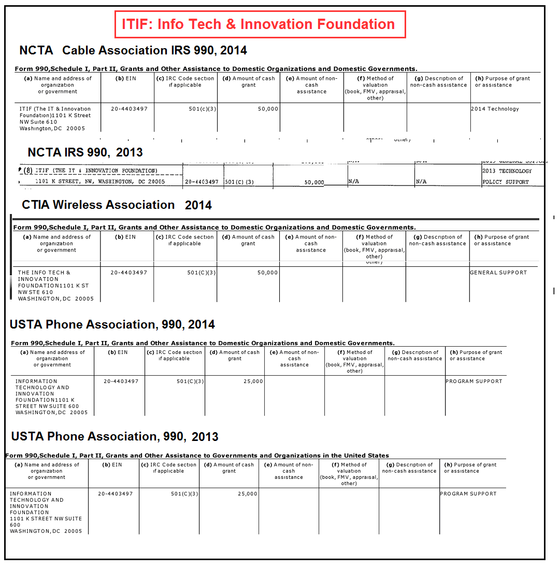 Here is the NCTA's (the cable association) IRS 990 forms for 2013 and 2014, revealing that TechFreedom, Free State Foundation, NAACP, National Urban League, and MMTC are all sucking on the teat of the phone and cable companies who arrange meetings like this to move public policies in their favor. They are joined by many others, but I'll get to that. 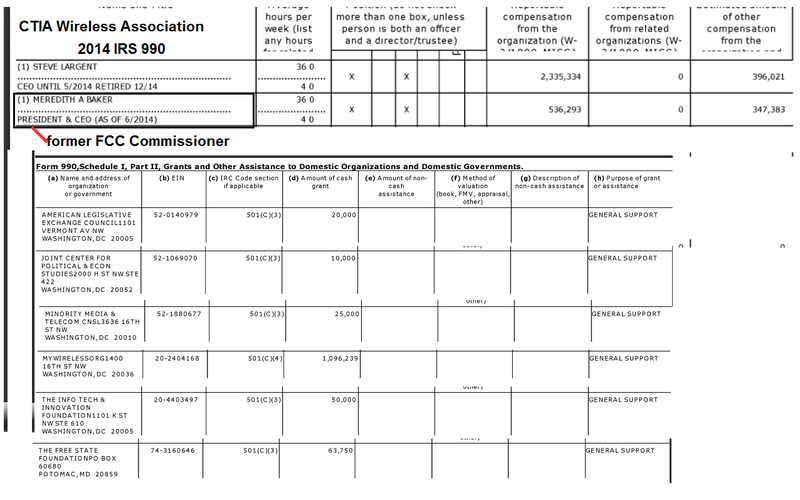 For just 2013, the cable association's IRS filing (as a non-profit) shows that the MMTC got $35,000 from the NCTA, NAACP (just the Washington DC chapter) received $50,000, Free State Foundation got $100,000, while TechFreedom got $25,000. But, in 2014, as shown below, the Free State Foundation got a whopping $105,000, MMTC got $58,450 and TechFreedom was up to $95,000; we guess the increases were to do these types of meetings. 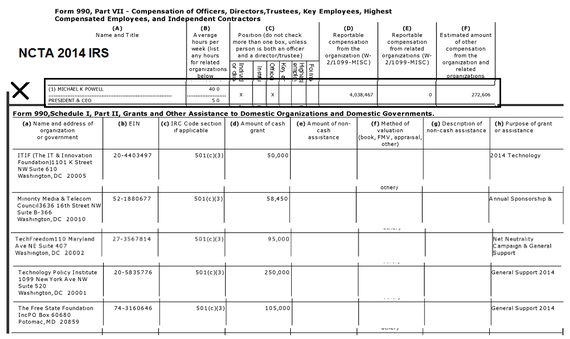 And notice - Hey, there's the former Republican FCC Chairman, Mike Powell, now CEO of the cable association, and he's made a cool $4 million dollars in 2014. Say It Loud: I Don't Believe You. Why stop here. Then we have the wireless association, CTIA. And what do you know? There's Free State Foundation, MMTC, and even ALEC, the American Legislative Exchange Council, who all got money from CTIA. And hey -There's Meredith A. Baker, now the President and CEO of the CTIA - and coincidentally, another former FCC commissioner. I'll return to the other groups listed above, like ITIF, as well as those at the FCC meeting, including Progressive Policy Institute and Hal Singer, as well as the FCC transition team leader, Jeffrey Eisenach, in a moment. The idea that the other FCC Commissioners left to work for the industry is not the case with Ajit Pai. Ajit Pai, the new Republican FCC chairman, worked for Verizon as "Associate General Counsel at Verizon Communications Inc., where he handled competition matters, regulatory issues, and counseling of business units on broadband initiatives." Later, he worked for Jenner & Block; their clients were/are the cable association, NCTA, in a case by Comcast against the FCC, then they also represented Comcast (in a challenge by Verizon about its marketing practices). Comcast Corporation v. FCC, No. 08-1114 (D.C. Cir.) - Represented NCTA in successful challenge to FCC rule capping at 30% of all subscribers the market share any single cable television operator may serve. Verizon California Inc. v. FCC, No. 08-1234 (D.C. Cir.) - Represented Comcast in challenge to FCC enforcement action against Verizon's retention marketing practices. But this isn't as troubling as the fact that Pai is a friend of the American Legislative Exchange Council, ALEC's telecommunications group--which is funded by AT&T, Verizon and the cable companies. This group has left a trail of scorched earth--where legislatures, using model legislation designed to help AT&T, Verizon and the cable companies, have been used like block municipalities from offering service or removing/ erasing Title II on the state level. "I am honored to be with you today to give the keynote address at this meeting of the American Legislative Exchange Council's Task Force on Communications and Technology. It isn't every day that a group comes to Washington, DC to advocate for a vibrant free market, limited government, and federalism. ...I congratulate you on the good work you've done on these issues in the past and look forward to working with you in the future. And going forward, please keep making your voices heard here in Washington." And he even commended their "model legislation" that strip-mines basic customer rights or blocks cities from getting upgraded - i.e., AT&T and Verizon helped to create legislation that was then handed to politicians, ALEC members, that were campaign-financed by the companies who helped to get into important state positions so they could help pass laws for AT&T and Verizon, et al. "The Task Force on Communications and Technology deserves special thanks for encouraging these reform efforts and for developing model legislation like the Advanced Voice Services Availability Act. In responding to the IP Transition, however, allowing new IP-enabled services to thrive free from undue intervention isn't enough. Some heavy-handed rules currently apply to the old telephone services provided by incumbent local exchange carriers. Those rules saddle carriers with tariffs, rate regulation, required cross-subsidization, and other requirements inspired by 19th century railroad regulation." And while Pai tells people he is for competition and companies like wireless ISPs, he doesn't bother with the facts, like the rules that outlawed competitors from using the networks - and the cross-subsidies that were designed to help the incumbent phone companies. And while I'm at it, the other Republican Commissioner Michael O'Rielly, spoke at the Free State Foundation's 10th anniversary luncheon - where, over the years, he laid out his plan to kill off Net Neutrality. "Let me start by extending my congratulations to Randy May and offering my sincere thanks for inviting me to be a part of the festivities marking the Free State Foundation's tenth anniversary. "Looking back, it is at Free State conferences where I dissected and disposed of the imaginary authority some claim is contained in Section 706 of the Telecom Act. It's also where I denounced the Commission's process and direction on net neutrality regulations, particularly its abuse of the forbearance function. And it's where I explored at length the need for FCC process reform. "Under Randy's deft leadership, the Free State Foundation has established itself as a leading champion of free market principles and policies that respect property rights and the rule of law. ...Right from the beginning, the Foundation has made invaluable contributions to nearly every major policy debate in the communications world." Gee. How nice. I didn't know free market principles were based on hiding who funds you and also to get 'non-profit' status--so they don't pay taxes. NOTE: Free State doesn't list the few hundred thousand it gets from the phone and cable companies' associations--or any other contributor. consultant to Verizon in various formats, for two decades. Here's a collection of different projects Eisenach did for Verizon et al. And yet, here is the leader of the FCC transition team. He has been a vocal critic, like Pai, about Net Neutrality and Title II, and never once noticed that Verizon's entire networks have been Title II for decades -- before the FCC decision, and it never harmed investment--it is the investment vehicle. And if you want to get pissed some more -- you know that every cent these people are getting, not to mention, for these associations, are paid by you and anyone with cable or broadband service. Ironically, while we hear that there is a call for "transparency" at the FCC, this doesn't mean that anyone has to reveal their backgrounds and biases, much less their current telco-cable funding. Next, we have ITIF, which sometimes I think should be called WTF. ITIF would like you to think that they are independent, yet they are also a 'non-profit' and they never reveal their funding sources. And recently, Robert D. Atkinson, the founder and president of ITIF wrote a scathing analysis of those who are pro-broadband and pro-Net Neutrality--groups and people who have been backing cities offering broadband service, or having government help fund areas. "How Broadband Populists Are Pushing for Government-Run Internet One Step at a Time"
ITIF can't be taken seriously when it claims it has the answer as it is, well, embarrassing. The other populist advocates for broadband are doing it because--THE INCUMBENT PHONE COMPANY NEVER SHOWED UP, BUT CUSTOMERS WERE CHARGED FOR UPGRADES, INCLUDING RURAL AREAS. Atkinson et al. have never, ever bothered to examine the fact that there were state commitments for fiber optic broadband deployments, state-by-state, or that there have been continuous rate increases to pay for these upgrades. Of course, ITIF never mentioned the failure to deploy broadband by the incumbents, AT&T and Verizon, which is the reason the 'populists' are doing what they are doing; Verizon et al. never showed up or even maintained their utility wires. 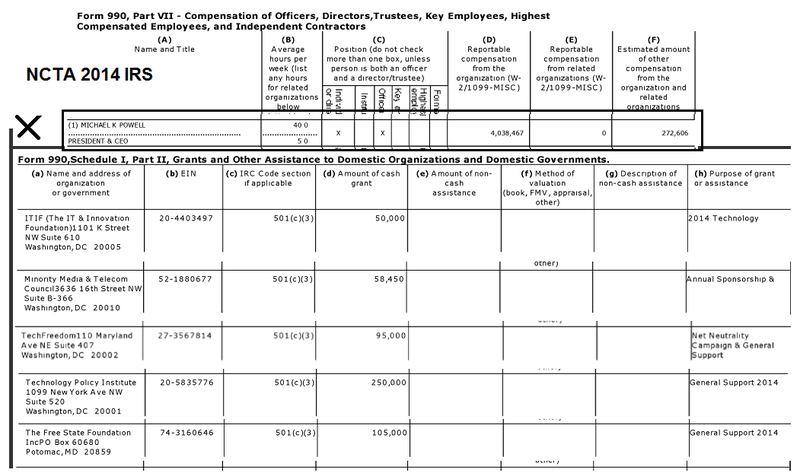 ITIF's funding? Well, here is just the NCTA, the CTIA, and the USTA, which includes Verizon and AT&T... duh. And they all have been giving ITIF money. But, does ITIF ever explain that their telecom practice is funded by the very companies that its policies are designed to help? 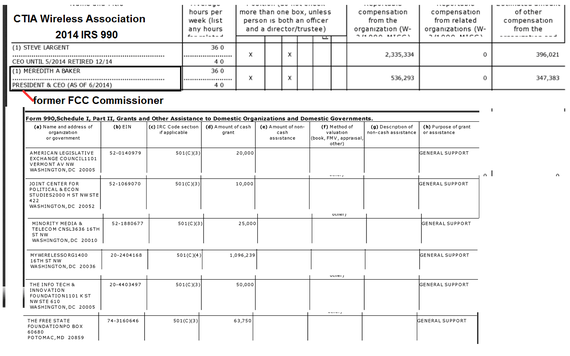 No, ITIF hides any funding and their non-profit, IRS 990 form shows they have a professional fund raiser raising money, (which isn't all for just telecom issues). Say It Very Loud: I Don't Believe You. 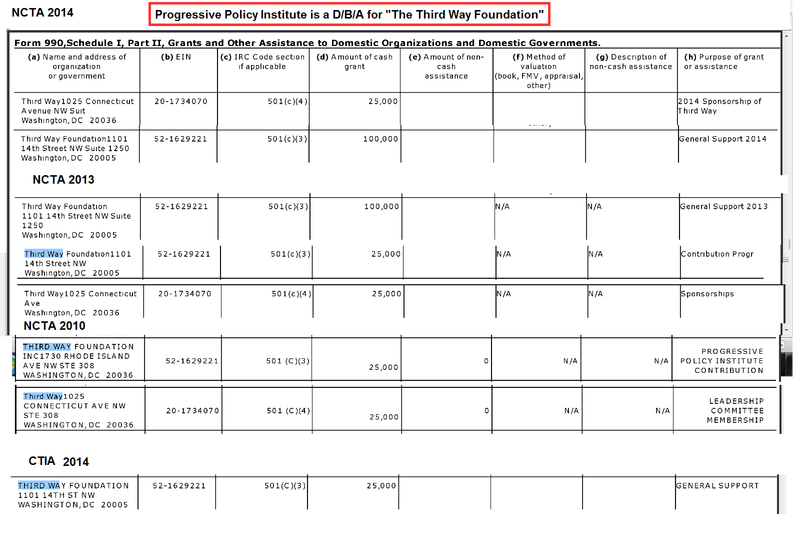 Besides those listed above that I didn't focus on like Tech Policy Institute, or the Joint Center of Political and Economic Studies, we go back to the "Progressive Policy Institute" and Hal Singer (PPI), who was at the FCC meeting. What caught my attention is the sleaze exposed while trying to find who is funding them. Ever hear of a group called "The Third Way"? 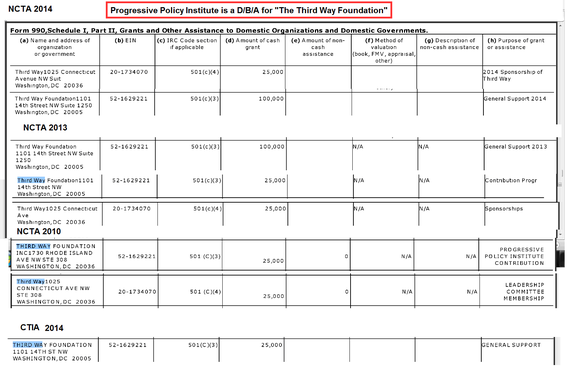 This is their IRS 990 for 2014 and it shows "Third Way Foundation" as the organization and it is doing business as "Progressive Policy Institute", a fact that we could not find on their web site or any other place that we looked at, to date. And the NCTA and the CTIA have been funding some of their work for years. "Free Market Groups Ask Congress to Rescind FCC Privacy Rules"
This letter isn't worth quoting. It's total crap. Essentially it involves one thing - should we, the public, have the right to "opt out" of companies who are tracking our moves with software, selling information about us, and passing it around to their affiliate companies? The law should be - Screw you. You need to ask for our permission to spy and track us. We should not have to figure out how to "opt-out" of your plans. I.e., the companies want the right, without asking, to surveil you and track you unless you call them and say stop; that should never have been allowed to happen. "We may use and share your CPNI among our affiliates and agents to offer you services that are different from the services you currently purchase from us. Verizon offers a full range of services, such as television, telematics, high-speed Internet, video, and local and long distance services. Visit Verizon.com for more information on our services and companies." "If you don't want your CPNI used for the marketing purposes described above, please notify us by phone any time at 1-800-333-9956, online at www.vzw.com/myprivacy or through Customer Service at 1-800-922-0204 from Monday - Friday 7 a.m. to 11 p.m. and Saturday - Sunday 8 a.m. to 9 p.m."
"Unless you notify us in one of these ways, we may use your CPNI as described above beginning 30 days after the first time we notify you of this CPNI policy. Your choice will remain valid until you notify us that you wish to change your selection. Your decision about use of your CPNI will not affect the provision of any services you currently have with us." The letter has a lot of groups listed. This is just the NCTA 990 IRS for 2013, and what do you know - many (if not all) of the signatories of the letter are funded by the cable companies - at least. 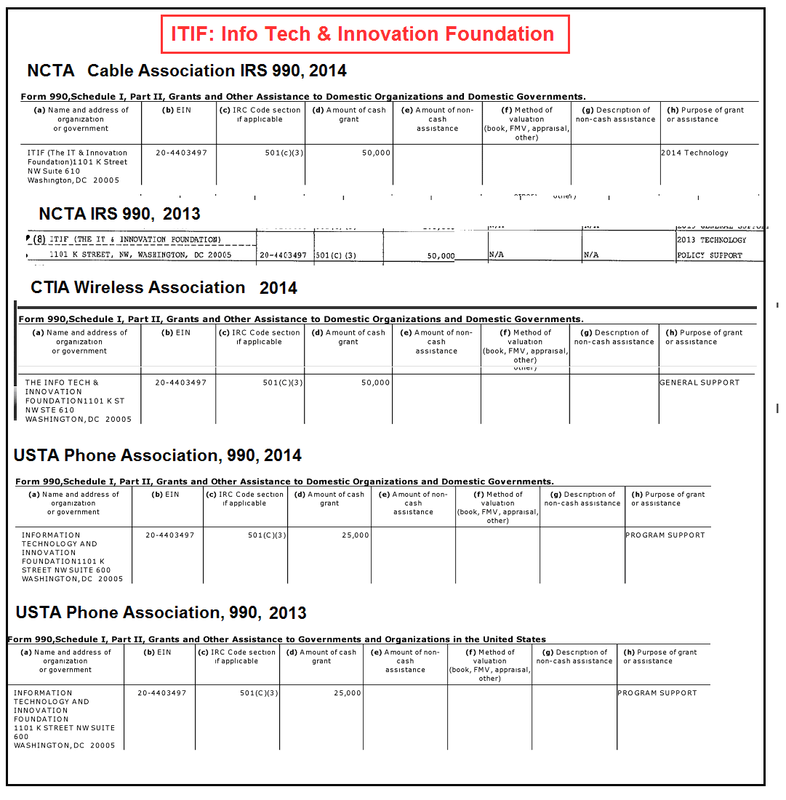 TechFreedom--We already discussed it gets money from the wireless association as well as the cable association. NetCompetition--This group has been around for a long time. There are other groups on the letter, but I've run out of patience to finish this. Scream: I Don't Believe You. Finally, many of these mostly non-profit groups are directly funded by not only the associations but also the individual companies, or other related organizations, sometimes through 3rd parties to make it seem less odious and harder to track the money. And while I didn't focus on it, some of these groups are tied to the Democrats or to the Republicans, but they are partisan--partisan to the corporate-monopolies/duopolies that control communications vs the public interest. And let us not forget that actually you, your family and business are paying for this as the companies dump the expenses for their association membership into 'corporate operations' and the even their lawyers and lobbyists are charged to you. And you pay taxes and they are mostly 'non-profits' that don't. Scream It: I Don't Believe You. Next Up - Time for Some Telco-Cable-Cabal Barbecue. These conflict-of-interest laden groups and people that hide their funding ties haven't bothered with facts about broadband deployment, Net Neutrality, Title II or privacy concerns. It's time for facts, not the pablum and telco-cable babble that these people would want you to believe.